Dubai: They say nothing says “I love you” more than a thousand red roses, but what if you have them loaded up in a shiny supercar and delivered right to your special someone’s doorstep? This is exactly what Alex Hirschi, an Australian expatriate based in Dubai, got as a Valentine’s Day surprise this week. It was two days before Valentine’s, when Nik Hirschi from Switzerland, standing at the doorstep of their hotel in the Palm Jumeirah, called his wife Alex to step outside. He had earlier spent the whole day prepping the car with the help of Edel & Stark Dubai and a team from 800flower.ae. “Come down to the front of the hotel, I’ve got something special for you for Valentine’s,” Nik told his wife. 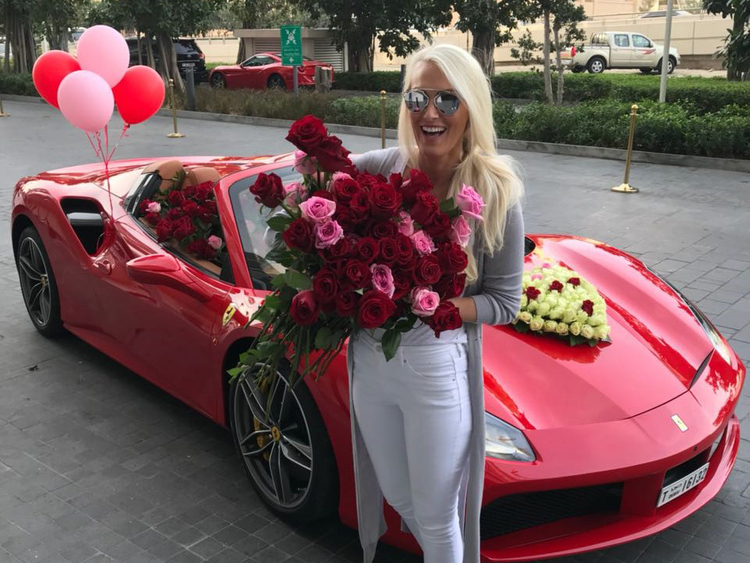 Just as she came out the door, Nik handed her a piece of red rose and led her to the parked Ferrari 488 Spider with 1,000 roses inside, and some red and pink balloons. “Oh my God. This is amazing. That’s insane,” Alex exclaimed in surprise. And just as she turned the engine on, rose petals came out of the exhaust. The whole scene, including the work that went into making the grand romantic gesture, was captured in a video that Nick posted on Youtube on February 12. An expatriate from Switzerland, Nik explained in the clip that Alex had been shopping for a new supercar. The model he picked happens to be on the top of Alex’s list of luxury vehicles to buy. Asked what prompted him to stage the grand surprise, Nik said he wanted to do something memorable for his wife to celebrate the day of romance. "I wanted to surprise her with something that no one has ever done, something beautiful that she can remember forever," Nik told Gulf News. "She loves cars and roses, so I combined it. I love her lots, she works incredibly hard, she deserves it." The car hasn’t been purchased, but it was just rented out for a few days, to help Alex decide which one she should buy. Unrelated: If you don't have a million dirhams to spare, here are a few budget cars under Dh50,000 (after VAT!) to consider in the UAE.